A wonderful time was enjoyed by all at the Dutchess County Office for the Aging Senior Awards luncheon yesterday. The Fountains was proud to have one of our residents, Bea Lacativa honored as a centenarian during the celebration. 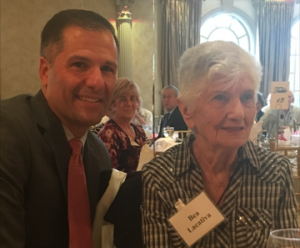 Bea is such an incredibly youthful 102 year old, that our County Executive, Marc Molinaro could not believe she was over 80! Bea credits her long and active life to a positive attitude, and good red wine. Thank you to Brian Jones, Outreach Coordinator for Dutchess County Office for the Aging for arranging such a lovely celebration at the Villa Borghese in Wappingers.